Papas in Spanish means potatoes. And papas in New Mexico means only one thing – delicious! 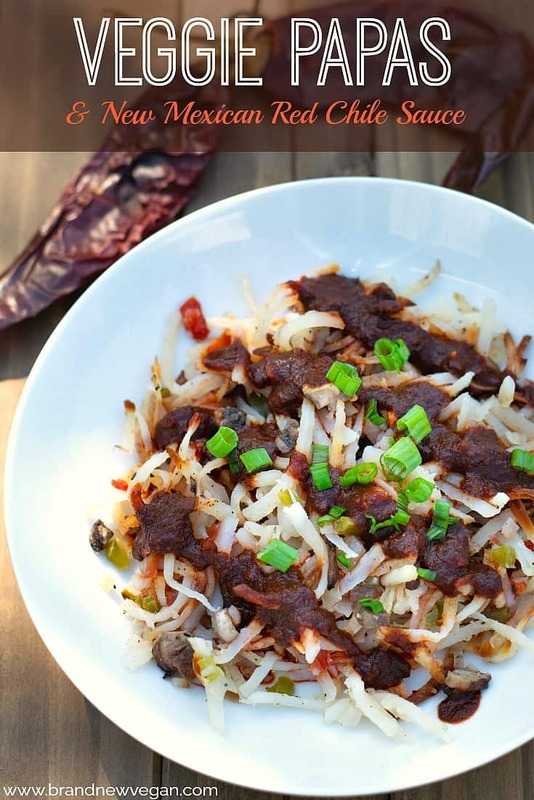 I just got back from Albuquerque and I want to share what I had for breakfast several times while I was there….. Veggie Papas with Red Chile Sauce. Basically, breakfast papas are hash browns. But when you order these babies in New Mexico, they are mixed with your choice of meat (or in my case veggies), along with a healthy smothering of either Red or Green Hatch Green Chile Sauce (or both, which they call Christmas). As yummy as this might sound already, they go one step further and top that with shredded cheese and an egg. Full of unhealthy saturated fat and cholesterol? Naturally. And the sodium content? Pssssshhh… please. Nevertheless, this is what I ordered most mornings (sans the meat, cheese, and egg – and extra Red Chile if you please). And I knew once I got home I was going to have to make this without the oil, and a lot less sodium. And last night I did just that. Baked hash browns mixed with onion, green bell pepper, mushrooms, and diced tomatoes – smothered in my own homemade New Mexican Red Chile Sauce. Wow. That’s all I got to say. Thank you Wecks for the idea and if you like hash browns, you are going to have to try these! Let’s start with shredding our potatoes. I cheated and used a bag of Simply Potatoes which you can find in the cooler section of many grocery stores. They are simply raw shredded potatoes (not frozen). Each bag is a little over 1 pound of potatoes. Or – you can shred your own. You’ll need about 3½ to 4 cups of shredded potatoes. You can use a box grater or a food processor with the grate option. I would suggest peeled, Russet Potatoes but I bet Yukon Golds would work as well. Important: If you do shred your own, place your freshly shredded potatoes in a small kitchen towel and squeeze as much moisture out of them as you can. The drier they are the better. 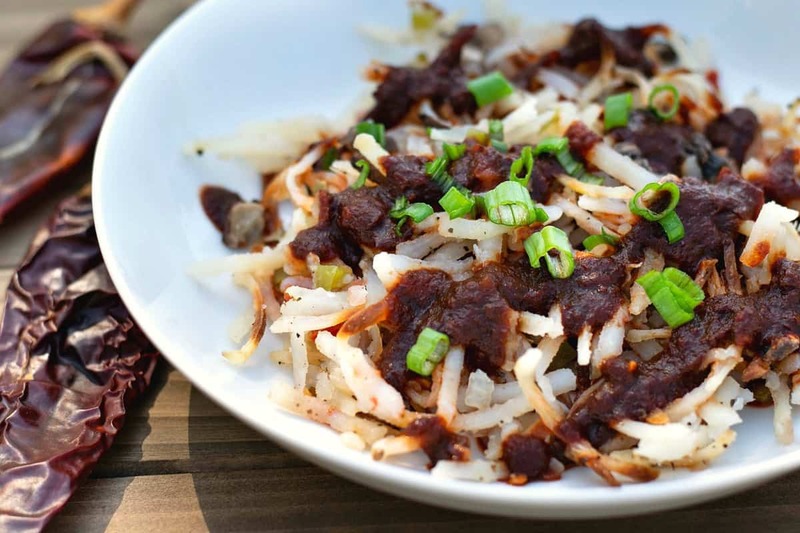 Place your shredded potatoes into a large bowl and set aside for now. Meanwhile, finely dice about ½ cup of onions, ½ cup of green bell pepper, ½ cup of fresh tomatoes (about 1 small tomato) and 1 cup of mushrooms (I used Baby Belllas). Mix the veggies into the potatoes and season with ½ tsp garlic powder, ½ tsp onion powder, ¼ tsp salt, and ¼ tsp black pepper. Finally, after preheating your oven to 450 ° F, lay your potatoes out onto a parchment lined (I used a silpat) cookie sheet and spread evenly. Make sure they are a uniform thickness across the baking sheet and kind of smash them down a little to compress them. Bake for 30 minutes or until the edges are nice and crispy. I highly recommend topping these papas with either my Red Chile Sauce or my Hatch Green Chile Sauce, although it isn’t absolutely necessary. You may like ketchup on your hash browns or salsa. However you want to enjoy them is fine – but you should really try the Red Sauce one day….. it is out of this world good. Hope you enjoy my Veggie Papás with Red Chile Sauce and let me just say – after being gone almost 2 weeks eating hotel food…..
A New Mexican breakfast delight. Freshly baked oil-free papas (hash browns) mixed with green bell peppers, onions, mushrooms, and diced tomatoes, smothered in my homemade New Mexican Red Chile Sauce. 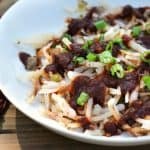 Prepare Red Chile Sauce (if using) according to THIS RECIPE. If shredding potatoes manually, be sure and squeeze any excess moisture out of them before continuing. Otherwise, place potatoes into a large bowl. Add veggies and spices and mix thoroughly. Turn potatoes out onto a parchment-lined baking sheet and spread evenly. Press down a little to compress (helps them stick together). Serve with warm Red Chile Sauce over the top. Mmm… I bet these would be good with the “CRISPY, OVEN BAKED, FAT FREE FRENCH FRIES” as well. Chuck, when are going to come out with a cookbook? It’s hard to find great tasting low-fat vegan recipes. Keep up the great work! “Chilli” is more commonly used in England and Europe. “Chile” is by far the most commonly used in America’s Southwest regions and New Mexico. “Chile” is actually the Spanish spelling and pronunciation of the word. However, “chili” is far more common in general usage and spelling, an Americanized spelling of the original “Chile” spelling that came out of Mexico. Die-hard chile pepper lovers argue that “Chile” is the only proper spelling, and that “Chili” refers only to the delicious food with meat, beans and chili spices that you eat out of a bowl, but most people use “Chili” or use both “Chili/Chile” interchangeably. Unless you’re from the U.K., then it’s probably “Chilli”, though they recognize all variations as well. Either way, all spellings are recognized by the dictionary.